In Hindu religion and vedic astrology, the nine planets occupy an important role. The planet deities are referred to as the NAVAGRAHA and are suppose to have a significant impact on the lives of individual and therefore a Hindu adorns these planets as deities, so that they may bring peace and harmony in their life and to avert any mishap. NAVA means nine. GRAHA means planet. Graha literally means to grab. They are probably called so because they cause eclipses by grabbing the Sun and other stars. Each of the planets is supposed to bestow a particular boon to humans. The Hindu science of study of these planets is called the Vedic Astrology. Classical Vedic astrology uses the seven visible planets Sun, Moon, Mars, Mercury, Jupiter, Venus and Saturn, along with the two lunar nodes, the north and south nodes, Rahu and Ketu. 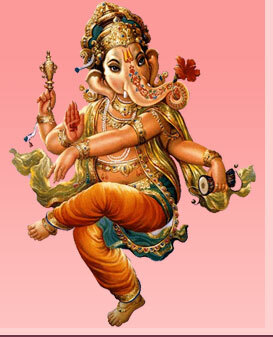 The Hindu astrology is based on an elaborate calculation of the positions of these planets at the time of one's birth. For example, the zodiac is divided in to twelve zones ('houses' of 30 degrees each). The planet Sun travels in to one of these houses each month. Similarly, the other planets have their times of travel through the zodiac assigned to them. As the planets travel through these zodiac signs, their relative positions with respect to each other changes and is supposed to determine the fate of the human affairs. An astrologer can draw up a horoscope of a person based on his time of birth and calculate the relative positions of the planets relative to this horoscope. The planets are also believed to influence the outcomes of historical events of entire nations and the Earth. Each planet has its own mode of circumambulation-clockwise or anti-clockwise. Each planet faces a different direction. In religious rites, beetle nuts represent the planets and the priest invites each planet to be present there and witness and bless the puja. Navagrahas the planet deities of which the first seven are Sun, Moon, Mars, Mercury, Jupiter, Venus, Saturn give names to the days of the week: Sunday to Saturday respectively. The other two Rahu (Ascending node) and Ketu (Descending node) are also fabled as planets, the former as a planet with a head and no body and the latter as a planet with a body and no head. In the Puranas, they are all represented as deities borne in cars. They are propitiated because of their sinister effects (Saturn, Rahu and Ketu) and for their favorable influences (Jupiter,Venus, Mercury, Mars, the sun and the moon). The favor of all must be conciliated before marriages and other auspicious events can be successfully accomplished. In addition to the nine planets, twenty seven nakshatras (constellations) through which the moon passes and twelve signs of zodiac of the sun, regarded as deities, are consulted at births, marriages and on all occasions of family rejoicing, distress or calamity. Shanti (Peace) propitiation ceremony is held to appease any unfavorable constellations.